Margaret stops dead, pointing into the trees. I don’t stop in time and smack into her backpack. I look where she’s pointing in the woods off to the right of us but don’t see anything. “What? I don’t…” I’m scanning the hillside above us. I’d been looking way too far. 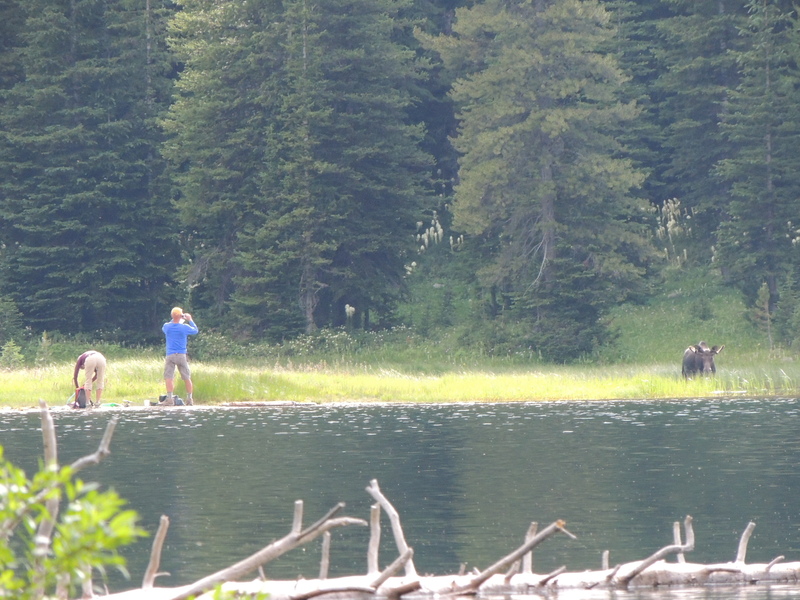 A bull moose is looking back at us, not even 50 feet away. Wow. And yikes. 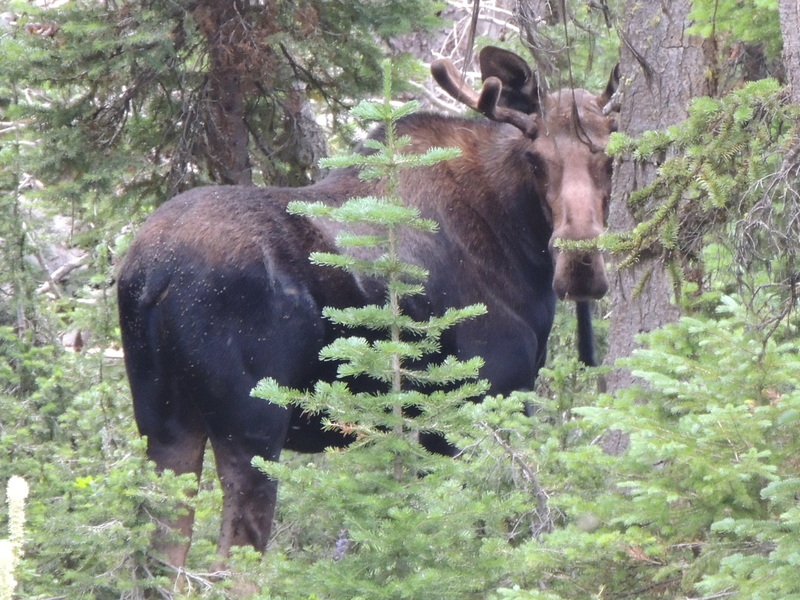 Anyone who spends any time in the woods knows that moose can be scary: a crabby moose is not to be messed with. But this guy was mellow. 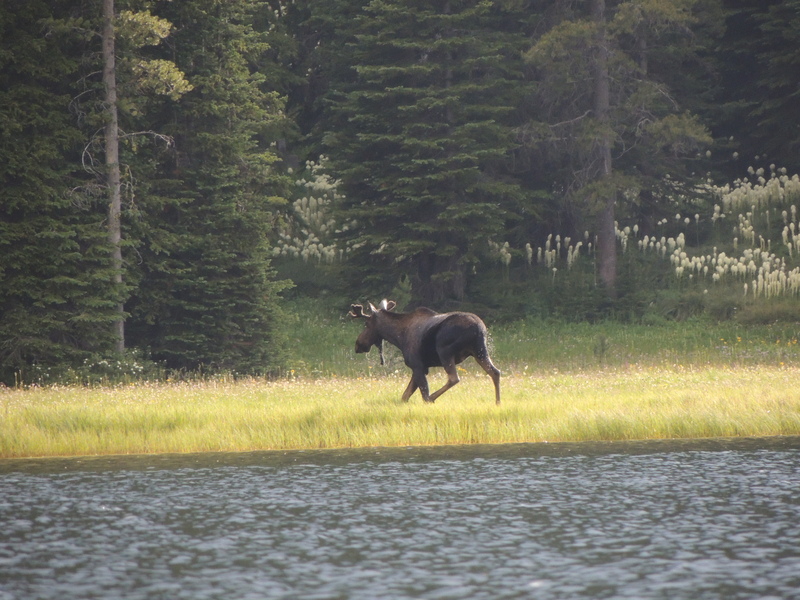 He looked us over, took a few steps, checked us out again, and then calmly went on his way. 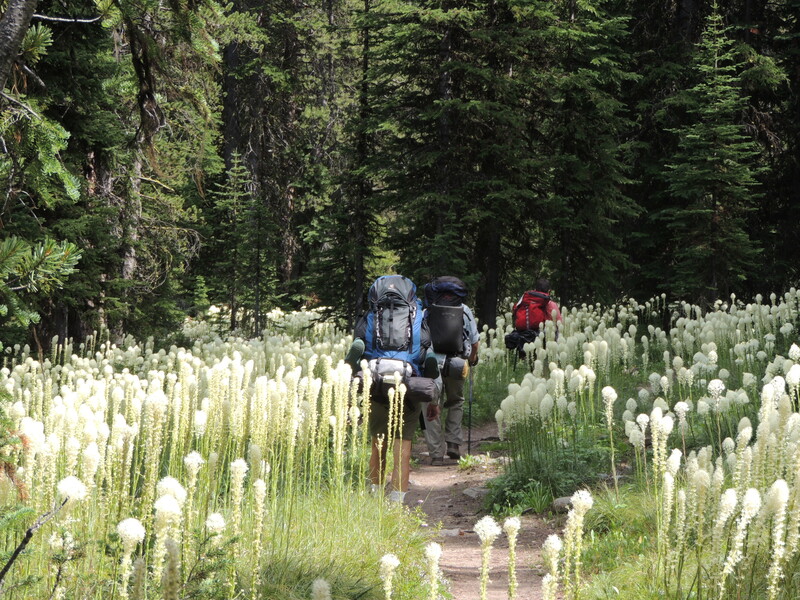 We were almost to our destination: Johnson Lake in the Pintler Wilderness. 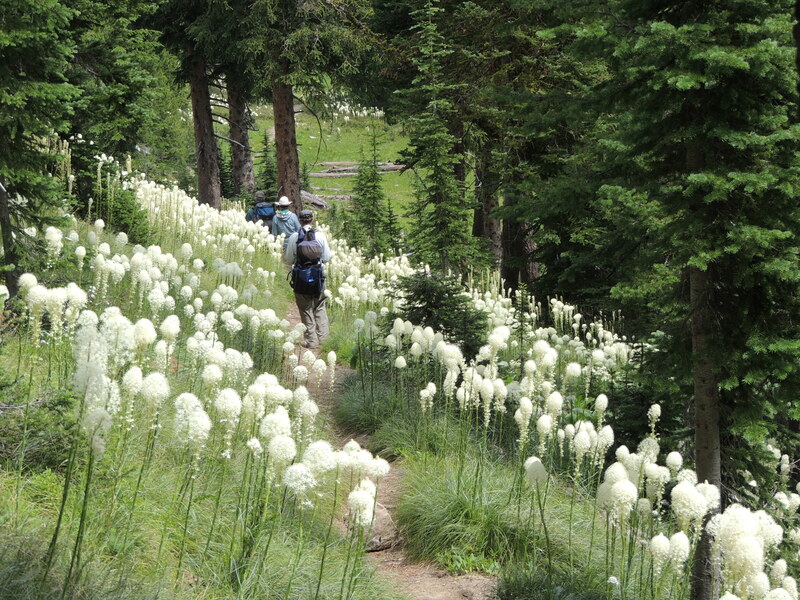 From the trailhead it had been a five mile steady climb, with increasingly incredible stands of bear grass. 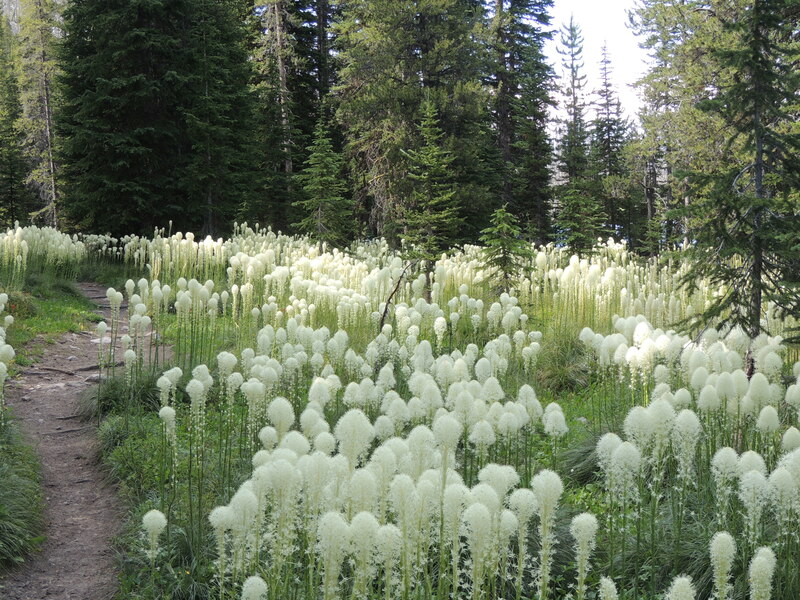 Bear grass is pretty much a northwest alpine phenomenon; you can find it somewhere every year, but every 5 years or so the blooms can be especially spectacular, and this has been one of those years. It looks like a sea of fluffy Q-tips. 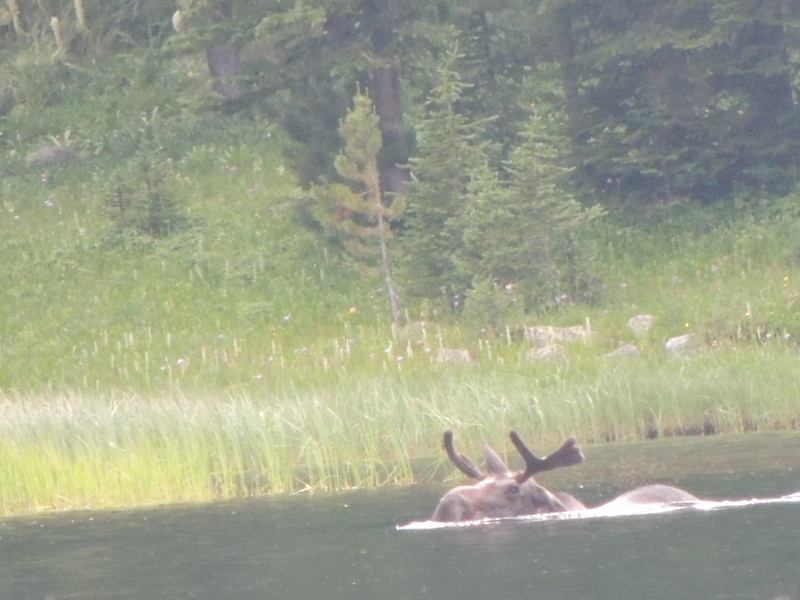 and the moose decided that his best option was to swim around these blokes who were insisting on standing their ground. 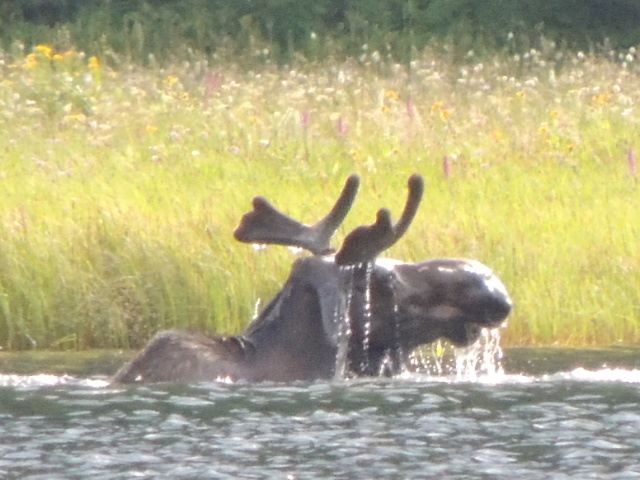 Lucky for them he was one mild-mannered moose! 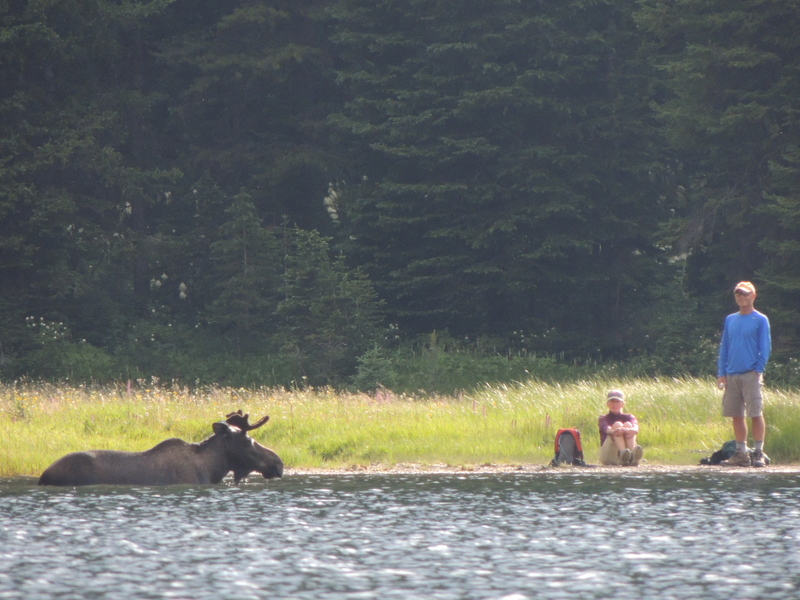 He parked himself in the lake, probably only 25 feet from these folks, and spent the next hour feeding and entertaining us all. What a story those guys had to tell their friends that night! As for me, I was happy to watch from my safe distance. 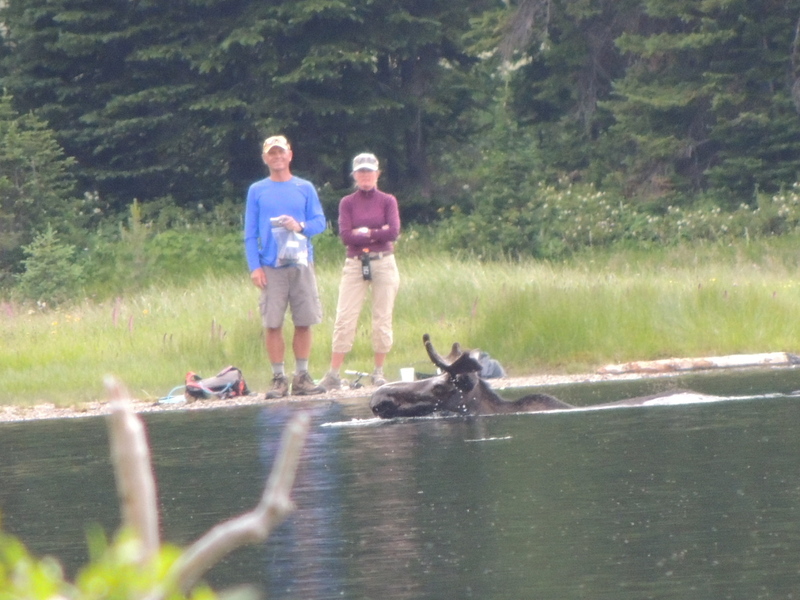 When the couple left the moose stayed a bit longer, but then something spooked him and he hightailed it into the woods. He could move when he wanted too, that’s for sure! 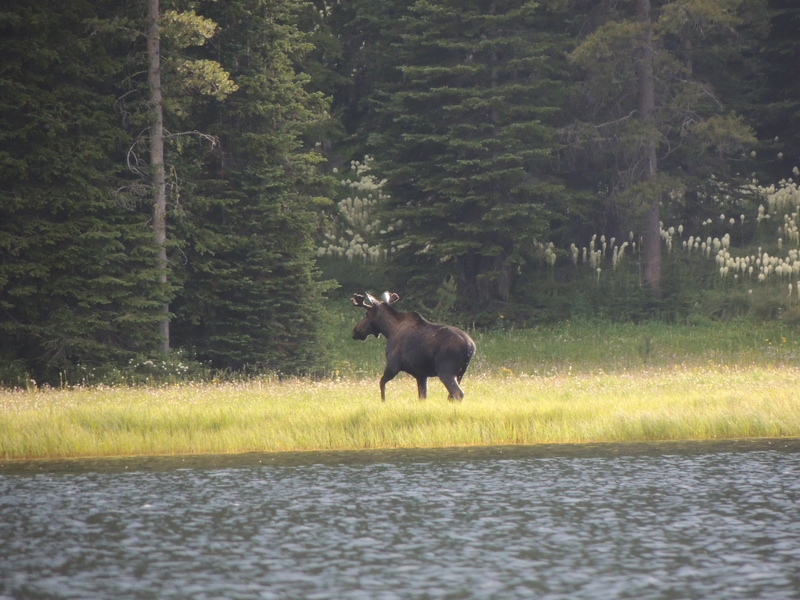 This entry was posted in Adventure, Backpacking, Hiking, Montana, Nature, Outdoors, Wildlife and tagged Bear grass, bull moose, Johnson Lake in the Pintlers, moose, Pintler Wilderness, Pintler Wilderness hikes. Bookmark the permalink. Wow! Great pictures!!! That’s awesome. 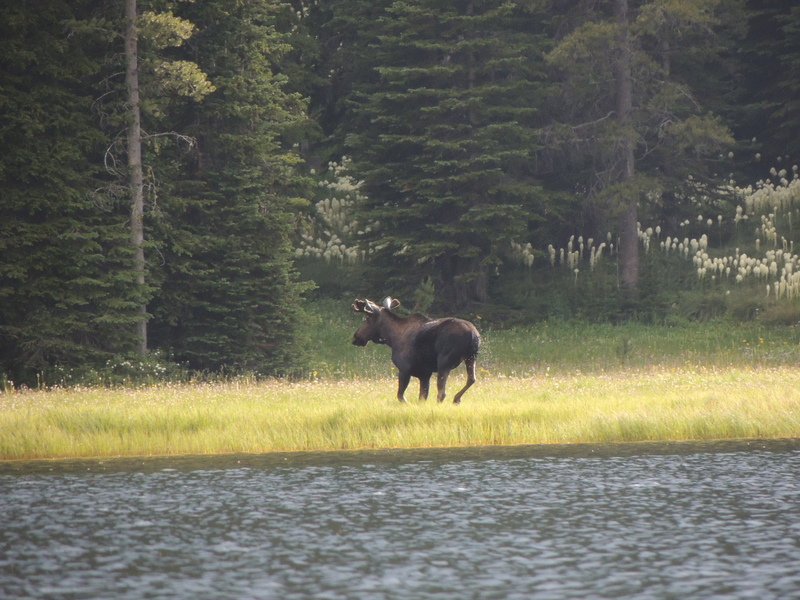 I spent an hour and a half with a moose a couple of weeks ago in Rocky Mountain National Park. They really are interesting creatures, but it is best to stay on their good side. Thanks. Best to stay on their good side, indeed! What crazy, misshapen-looking animals they are. That head! They look like they’d tip over, don’t they? But there’s no lovely ocean here! What a stunning set of images….it looks like an incredibly beautiful place. 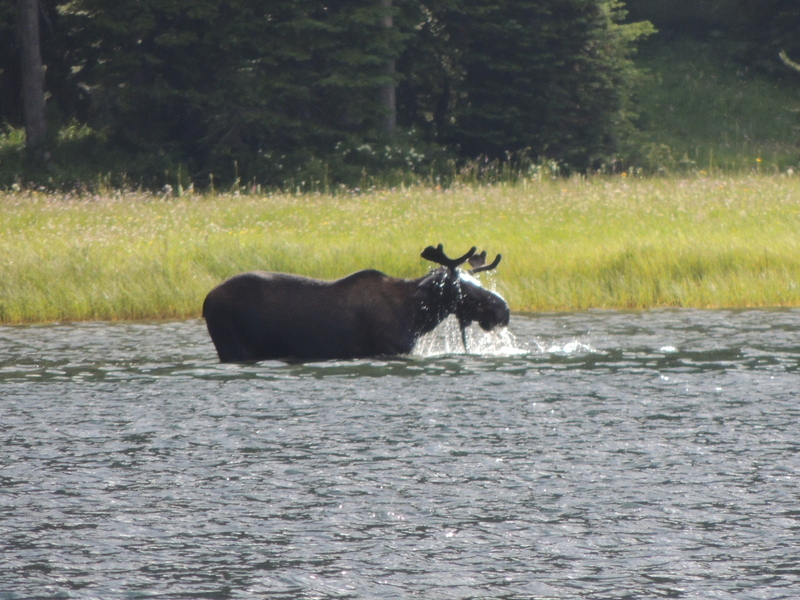 Love the bear grass, it makes gorgeous images…..and what a treat watching the playful moose! 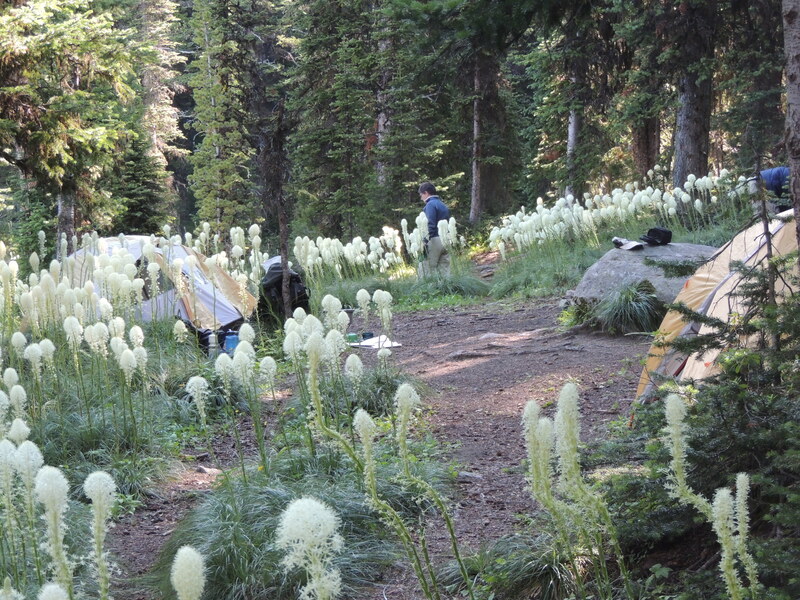 We were all commenting on how lucky it was that we weren’t allergic to the bear grass – the pollen was all over us! Wow! and Wow!!! What a fantastic story! Ya’ll are so lucky!!! 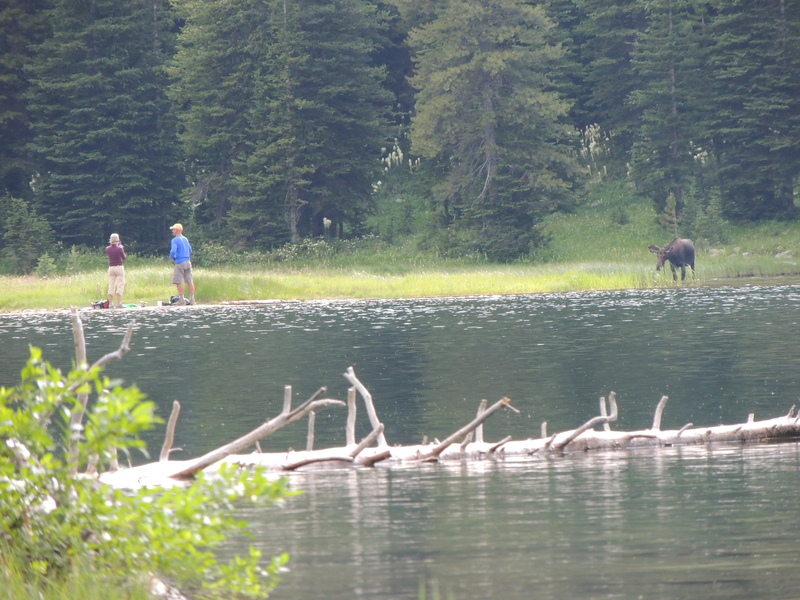 Great shots of the moose and those crazy people. I don’t believe I would have just stood there! I wouldn’t have, that’s for sure. The woman was definitely more nervous than the guy. Hmmmm..
What a great hike – wish I was with you. It was a great hike! Thanks for reading. We were lucky, that’s true. Thanks. 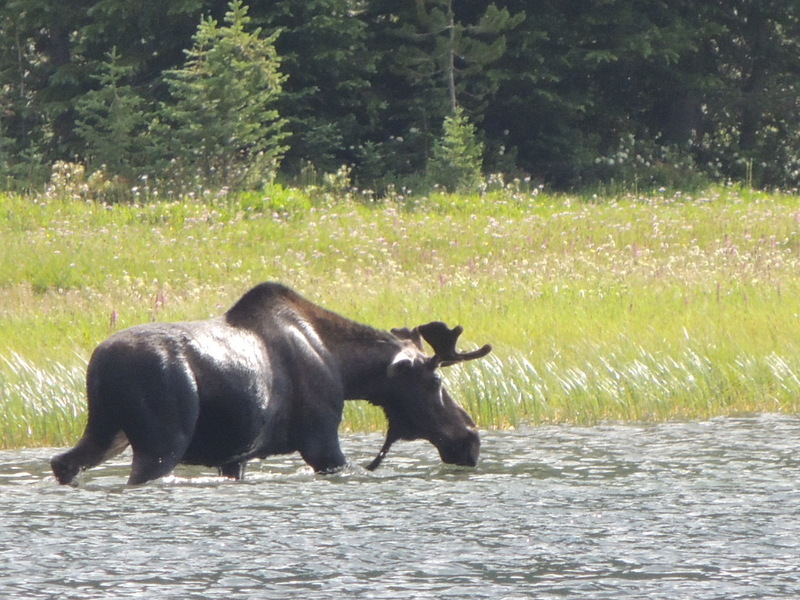 What an outstanding series of moose images. 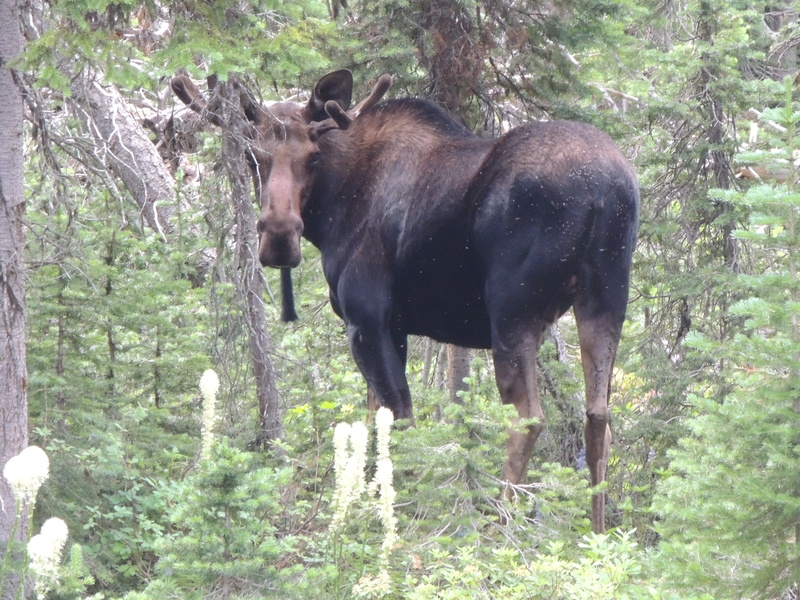 You seem to have a healthy respect for moose and I have to wonder about those other hikers. Thanks for this journey into the wild. Once again, you are showing me places and things I have never seen. 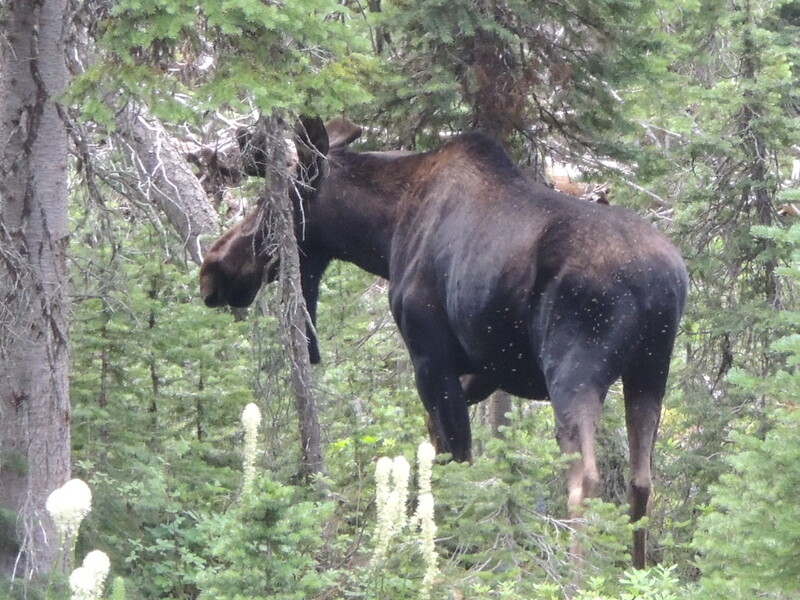 A friend of mine was chased up a tree by an angry moose, so I know how temperamental they can be! Thanks for the nice comment.